254 Republican County Chairmen for all of the 254 Counties in Texas! Republican Party of Texas - Today, the Republican Party of Texas is very excited to announce that for only the second time in the last decade, every county in Texas has a current Republican County Chairman and will hold a Republican Primary election in 2012. The last time this has been accomplished was in the year 2002. 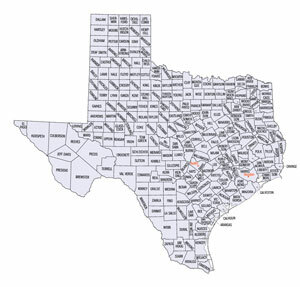 Texas has more counties than any other state in the country with 254 counties spread across the Lone Star state (nearly 100 more than the next highest, Georgia with 159.) The Texas Election Code states that the November General Elections are held by the State and therefore, counties are not required to have a local party county chairman in order to hold that election. However, Primary Elections are a function of the State Party, and do require a local county chair in order to hold that election. After the last Republican State Convention there were over 20 vacancies in the state. RPT Political Director Travis Griffin and Beth Cubriel, RPT Organization Director, worked to fill all but nine places by the end of October 2011. The remaining vacancies were in the counties of: Brooks, Culberson, Dimmitt, Hudspeth, La Salle, Loving, McMullen, Presidio, and Zapata. The largest road blocks to filling these spots were the location and sparse population of the counties – all centered in the southwest and border regions of Texas, and areas where there is not typically much in the way of Republican Party activity. At the third quarter SREC meeting, the Volunteerism Committee, chaired by Leslie Recine, voted to specifically address these vacancies and to provide funding for a new RPT staff member to help achieve the final goal of filling every county. Using these funds, Chairman Munisteri hired Cassie Daniel as an RPT field representative to focus on this important task. After suggestions and help from SREC members, other party activists and county chairs in the surrounding counties Cassie was able to steadily recruit and fill each of the open positions over the last two months. Typically the County Chairman is elected on the primary ballot. Many of these counties do not have any Party activity and therefore the State Party Officials Committee can approve individuals selected to fill a vacancy. On the last day before the filing deadline, Zapata County was filled as the last remaining vacancy, giving the RPT 254 of 254 positions filled. Through Cassie’s work, the Republican Party of Texas has not only achieved its initial goal of holding a statewide primary – but several counties have incumbent candidates who are now switching parties to run as Republicans! In McMullen County, there are three current elected officials that now have the chance to run as Republicans with an additional two candidates who are running on the Republican ticket! For a full listing of all 254 Republican County Chairmen – please visit our website.